In 1846 the Oregon Treaty was signed, setting the international boundary at the 49th parallel. Among the settler engagés of the Hudson's Bay Company, many now began to cast their eyes towards the north. On August 7, 1848, in the Willamette, the marriage of the son of Marguerite Brulé was recorded in the register of the Mission of St. Paul.."in view of the publication of 1 ban of marriage and dispensation... between Joseph Brulé, minor son of the late Jacques Iroquois and of Marguerite Brulé of this parish on the one part and Marie Ann Maranda dit la Frise .. of this parish on the other part .. have received their mutual consent to marriage and given them the nuptial benediction in the presence of of Jean Baptiste Brulé, foster-father and step-father to the groom, consenting as well as the mother, and of Louis Maranda dit le Frise, father of the bride, consenting.." registered by A. Langlois, priest. Marie, or Mary Ann as she was generally called was the daughter of a man well known at French Prairie and St. Paul in the Willamette Valley, Louis Maranda (or sometimes known as Louis Marchelle) and nicknamed "Frizzee". Becuase of her marriage to Joseph (Iroquois) Brulé, Mary Ann was to have a significant role to play in the settlement of Sooke. 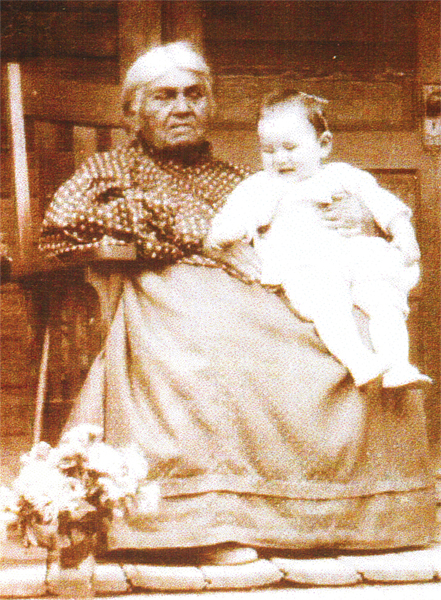 A "Grandmother of the West" - truly the role of Mary Ann Maranda, (aka Mary Ann Marshelle ( Maranda / Louise / Shaegoskata Daughter of Louis Shaegoskatsta (aka le Frise) and Louise, Kalapuya or Churathea (born about 1814) who wed Joseph Brulé in Oregon. Generations later, descendants were recalling tales of the large cavalcade, freight wagons and months on the trail to reach British Territory. Living on the east bank of Sooke River with the large family group, Mary Ann continued bearing babies, so that her children with Brulé numbered six. The family home-site was of log buildings, and situated approximately at the riverbank end of what was later to be named Calvert Road. In 1858 her husband Joseph died. In 1860 she married Jean Baptiste Vautrin, and later, moved about the southern Vancouver Island area, as work took him to Mill Bay, Victoria and other sites. 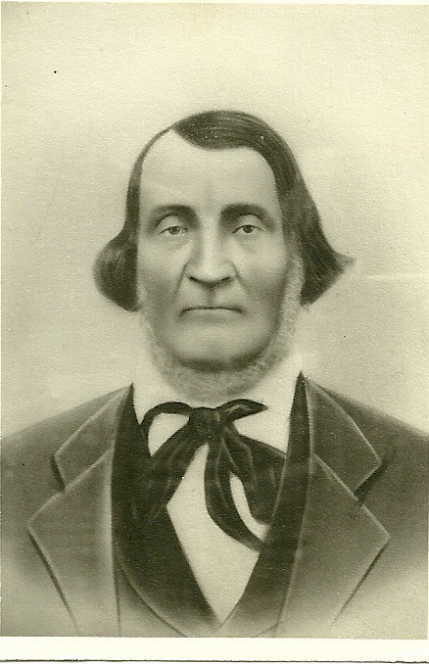 One of the men who had traveled north from Ft. Vancouver to Ft. Langley, Joseph Poirier, had come to Sooke to fall timber for Captain Grant and settled on land by the river. As Mary Ann's first family reached adolescence, and while she was bearing addition children to Vautrin, her daughter Ellen caught the eye of Joseph Poirier. Married to Poirier, Ellen, too, raised a large family, living in a cabin on the river flats. Poirier was to sell that site to Edward Milne in the 1880's. Conditions were difficult in the times, and frequently parents had to endure the sorrow of losing children at birth or through illness. Joseph and Ellen Poirier were no exceptions, but their children who grew to maturity, were to number twelve. First was Joseph Jr. who grew up to marry Mary White; then Mary Ann, who married Joseph Enos; Adolphus who remained a bachelor; Louise who married Alfred Fletcher; Ellen who married Thomas Jefferson Robinson; Isobel who married Andrew Davidson; James who married Alice White; Victoria who married a Mr. McLeod and widowed, married Harry Dilley; Pete who married Kit Michelsen; Adelia who married Harry O'Meara and later Robert Lidgate; and the youngest, Cecile, who married William Johnson and then later, Harry Dilley. Most of these families remained on Vancouver Island, and readers can readily imagine the numbers of youngsters who have grown up from these origins in the generations since Mary Ann met Joseph. Generations of Poiriers have been renowned woodsmen, hunters and fishermen. The story does not end there, for Mary Ann produced nine more children with Jean Baptiste Vautrin. Though many of these offspring were to return to Oregon with their parents, where Mary Ann was to find herself, once again, a widow, the Vautrin name did remain in the Victoria area, with many addition descendants. Her daughter Cecile Brulé had married a Mr. Fullem, the Fullem's daughter Mildred and her husband Abe Holmes are a part of a large American contingent of the family. From Mary Ann's marriage to Jean Baptiste Vautrin, perhaps the best known in Sooke of their children, was Mary Ann, who was to grow up to marry John Goudie. Also descended from a fur-trade family, John Goudie was living west of Sooke, and listed as a "chopper" in the 1881 federal census. Their first child, Dora Jane, was to marry James George French; next was Margarite who married a Mr. Stewart; James who married Lily Michelsen; Rosalie who was unlucky in marriage; George who married Lizzy Poirier; John who remained unmarried; Peter who wed Mary Newbold; Isaac, a bachelor; Josephine who married James Gold; Arthur and Frank, also bachelors; Pearl, who married Herbert Stephens and then Daniel Boon; and the youngest, Kate, who married Frank Hughes. James Goudie (Sr.) sailed from the Hebrides then came to the Pacific coast with Capt. McNeil on the Lima in the early 1830's. He went to the Hudson's Bay Company at Fort Vancouver. Later, working at Fort Colvile, he met Catherine, and began to court her. He brought her father an iron knife he had made, and many visits followed. They were married at the Fort, and children came, one after the other. With the Oregon Treaty, the Goudies like so many others relocated to the British territory, and James, Catherine and the children made a new home in Fort Victoria. In the diary of Robert Melrose, Victoria, Tuesday Nov. 29, 1853: "James Goudie's wife died - Catherine." The Goudie family have had a great impact on South Vancouver Island history. In the Sooke area, it has been the family of their eldest son John through his marriage to Mary Ann Vautrin, that has been an ongoing presence. Born in 1836, his parents still at Colvile, he is believed to have been employed by a telegraph company when they received the wire from Oregon that President Lincoln was shot--April 15, 1865, according to grandson James.